We were delighted to present a cheque for almost £1700 to the Love the Broads Visitor Giving Scheme last week. This has brought the total of our donations over the last four years to over £5000! We donate £1 for each cruiser holiday taken within our main season mid-March to 31st October. 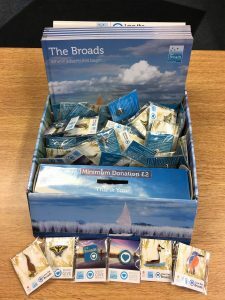 We also have ‘Love the Broads’ badges and books in our receptions and on our Broads Tours passenger boats that visitors can buy for a suggested donation of £2. The money we have donated has been used for two very special projects. The first is for a new mooring project at Fairhaven Woodland and Water Garden where it is intended to erect six, new 24-hour moorings and two permanent moorings. 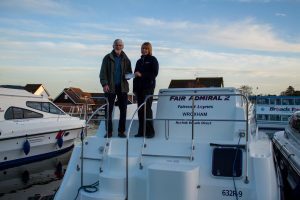 This will allow access to the local village of South Walsham for people staying on boats. The funding granted to date will cover the costs of the project design and planning application costs. When built the new moorings will significantly benefit the local community, pub, post office and shop as well as local visitor attractions. The second project is to part fund the production of an educational booklet detailing the history of the Broads from creation to modern times. This is a joint project between Love the Broads, the Norfolk Wherry Trust and Norfolk Broads Direct. This booklet will be given out to children on school visits to the Norfolk Wherry Trust and to children taking part on Broad Tours’ Discovery trips. It will also be available to download on these organisations’ websites and will be shared with other Wherry organisations on the Broads.